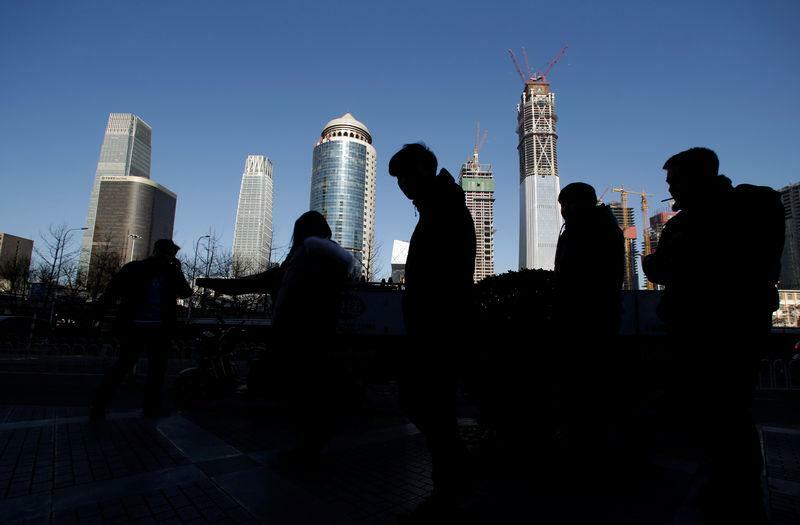 BEIJING (Reuters) - China's economy grew a faster-than-expected 6.8 percent in the fourth quarter, boosted by higher government spending and record bank lending, giving it a tailwind heading into what is expected to be a turbulent year. But Beijing's decision to prioritize its official growth target could exact a high price, as policymakers grapple with financial risks created by an explosive growth in debt. China's debt to GDP ratio rose to 277 percent at the end of 2016 from 254 percent the previous year, with an increasing share of new credit being used to pay debt servicing costs, UBS analysts said in a note. The fourth quarter was the first time in two years that the world's second-largest economy has shown an uptick in economic growth, but this year it faces further pressure to cool its housing market, the impact of government efforts at structural reforms, and a potentially testy relationship with a new U.S. administration. "We do not expect this (Q4 GDP) rebound to extend far into 2017, when a slowdown in the property market and steps to address supply shortages in the commodity sector ought to drag again on demand and output," said Tom Rafferty, regional China manager for the Economist Intelligence Unit. The economy expanded 6.7 percent in 2016, the National Bureau of Statistics said on Friday, near the middle of the government's 6.5-7 percent growth target but still the slowest pace in 26 years. Economists polled by Reuters had expected 6.7 percent growth for both the fourth quarter and the full year. Housing helped prop up growth again in the fourth quarter, with property investment rising a surprisingly strong 11.1 percent in December from 5.7 percent in November, even as house prices showed signs of cooling in some major cities. Consumer spending was also strong, with retail sales in December rising at their fastest pace in a year on stronger sales of cars and cosmetics. Fixed asset investment grew 8.1 percent, the slowest pace since 1999, as investment by private firms slowed again in December on a monthly basis. Private sector fixed asset investment fell to 4.07 percent from 4.93 percent in November, according to Reuters calculations based on statistics bureau data. Consumption contributed the bulk of growth last year, but income growth didn't pick up, and a measure of China's income inequality rose slightly last year, the statistics bureau said. Amid signs of stabilization, policy sources told Reuters that China's leaders will lower their economic growth target to around 6.5 percent this year, giving them more room to push reforms to contain debt risks. They will not want to let growth fall too sharply, however, ahead of a key party meeting in the autumn when a new generation of leaders will be picked. "Economic stability is always important but will be an even higher priority ahead of the 19th Party Congress," said Tim Condon, Singapore-based economist at ING. In a sign of the tasks ahead, the People's Bank of China unexpectedly cut the amount banks must keep in reserve on Friday, a measure aimed at easing tight liquidity ahead of the upcoming Lunar New Year holiday. "Today's move seems to suggest that liquidity conditions are tighter than authorities' expectations, as capital outflows remain strong," said Zhou Hou, senior emerging markets economist at Commerzbank in Singapore. Capital outflows have been putting strong downward pressure on the yuan, which lost nearly 7 percent last year, making it the worst performing major Asian currency. Rapid monetary expansion and expectations of slower economic growth at home, along with a rising U.S. dollar, also hit the yuan. "The key risk to the Chinese economy in 2017 and 2018 is the possibility that faster than expected U.S. interest rate increases could intensify Chinese capital outflows and increase stresses on China's financial system," said Bill Adams, senior economist at U.S.-based PNC Financial Services Group. China's sluggish exports could also come under fresh pressure if U.S. President-elect Donald Trump follows through on pledges to impose tough protectionist measures. "Relations with a Trump administration is the biggest known unknown. Trump advisers and cabinet-nominees have identified the U.S.-China relationship as in need of adjustment to support the president-elect's objective of a manufacturing renaissance," said Condon. China's central bank could slightly tighten credit conditions this year to encourage debt-laden companies to deleverage, but it's unlikely to rush to raise interest rates despite an expected pick-up in inflation, policy insiders said. "Looking at the economic forces out there both globally and domestically, I think that China will face a few headwinds. Externally, mainly from a change in the climate in the U.S. with regards to China's exports...(and) within China I think we will see a bit of impact from the slowdown in property investment," said Louis Kuijs, head Of Asia economics at Oxford Economics in Hong Kong.